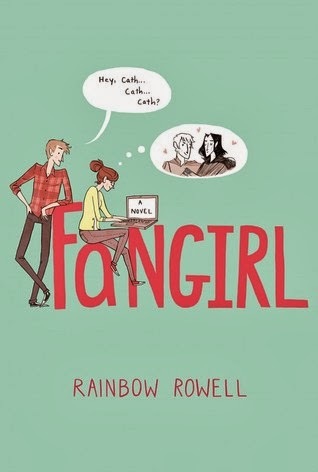 I wrote about Fangirl back in October after listening to the audiobook, but now I've read the print version in preparation for my Not-So-Young Adult book group at work and have a few more thoughts. I won't summarize the story again, so look at my old review if you need to familiarize yourself with the basics. A happy result of having listened to the audio first is that the entire time I was reading I heard it in Rebecca Lowman's voice in my head. God, I could listen to that woman read anything. (Ok, maybe not anything. I won't be downloading her audios of Nicholas Sparks books.) But I hope that Rebecca Lowman narrates every book that Rainbow Rowell ever writes. When I listened to the audio I had a bit of trouble with the excerpts from the Simon Snow books and from Cath's fan fiction. Sometimes I wasn't sure which it was for a while, and it was also just hard to switch gears and start paying attention to the story within the story. That aspect went much more smoothly reading it in print and I was actually able to follow the stories a bit more. There is a part in the book where Cath submits a piece of fan fiction for a creative writing assignment and the professor refuses to accept it, leading to an argument about whether or not fan fiction counts as legitimate writing. I didn't think much about this when I was reading, but my book group spent quite a while on this topic as several of them read or write fan fiction themselves. Overwhelmingly, they thought the professor was being unreasonable and I have to agree. One person mentioned all the retellings of Shakespeare's plays that are considered legit and you know, that's a really good point. Why would it be ok to retell Romeo and Juliet, or a fairytale, but not take characters from one story and put them in another? Is it just a matter of whether or not the names are changed? Last time I posted about Fangirl I barely mentioned the dad's problems, but this time I was quite struck by his character and by his relationship with his daughters. After their mother left, he raised them alone while struggling with his own mental health issues. Although he sometimes went off the rails, it was clear to see what a good father he was. In one particularly touching scene, he has been hospitalized and when Cath arrives she wonders how he was when he was brought in, if he was screaming or had to be restrained. "She wanted everyone here...to know that her dad was a person, not just a crazy person. That he had people who cared about him and who would notice if he was roughed up or given the wrong medicine." It's significant in young adult literature to have a well-developed adult character, and their dad seemed especially genuine. There was just something I loved about the way that the girls and their dad took care of each other, like it wasn't just a one-way street. The more I look through at the pages I marked, the more scenes and quotes I want to share. I have about 27 favorite parts of this book, I'm pretty sure. It's clever and funny and a bit heart-wrenching, and definitely worth reading a second time. I read this after your last review and thought it was great! The mittens bit was such a reminder of college and I also enjoyed how all three took care of each other. Good recommendation!